The MS 362's optimum combination of torque, power and weight, with a wrap-around handle (R). 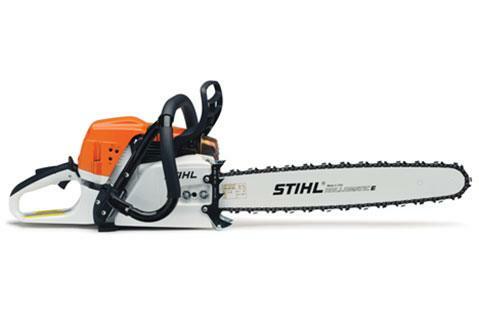 With low-emission, fuel-efficient engine technology, the STIHL MS 362 R C-M professional chainsaw is engineered to save you time and money. Use up to 20% less fuel compared to previous models, and with the new pre-separation air filtration system, you’ll have fewer filter changes and longer run times. The advanced anti-vibration system allows you to keep working comfortably for longer periods of use during most applications, including logging, thinning, arborwork and large woodcutting jobs. All this, plus 70 percent lower emissions compared to previous models, makes the MS 362 R C-M an ideal choice for professionals and serious users. As part of a new platform design concept, the MS 362 R C-M allows for quicker, more streamlined serviceability from your local STIHL Dealer.